As the “Golden Games” draw to a close there is a sense of great pride and celebration in the UK. We have diving and the 5,000 metres to look forward to tonight, so perhaps Team GB has time for a final gold medal flourish. I for one will be feeling just a little bit bereft when it’s all over next week. Like other Londoners we have lived and breathed London 2012 for the last 7 years. Fair enough, we still have the Paralympics to enjoy, but they will also be over in a flash. 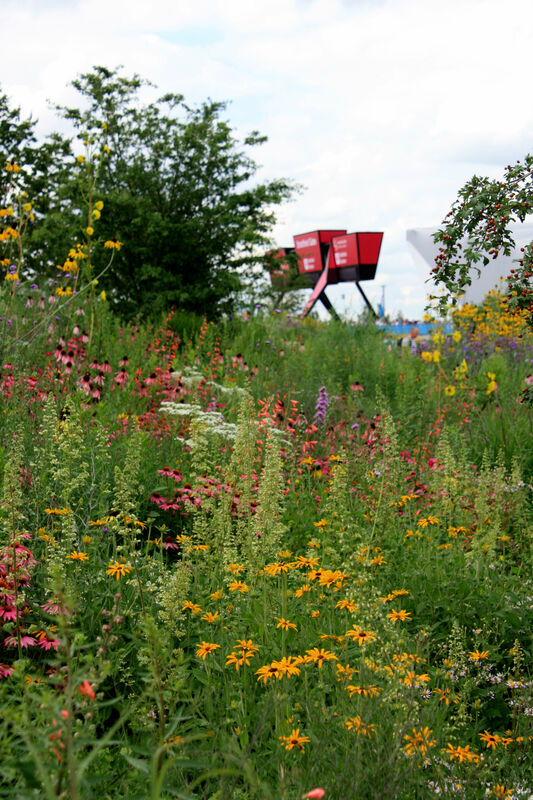 What will endure is our amazing Olympic park. The removal of temporary venues will double the amount of green space and create the largest new urban park in Europe for 150 years. Much of the space will quite rightly be planted with native British plants to reinforce the existing ecological network. But I hope the wonderful waterside plantings based on world flora develop and endure for future visitors to enjoy. Strung out for half a mile, the 2012 Gardens “represent a living timeline of Britain’s long history of exploration, trade and plant collecting, and its impact on the richness and diversity of British gardens”. They draw inspiration from the wild flora of Europe, North America, the Southern Hemisphere and Asia. The gardens are the work of James Hitchmough and Nigel Dunnett, both professors at the University of Sheffield, and Sarah Price, a garden designer. The website http://www.2012gardens.co.uk/ provides lots of further information and invaluable plant lists, which I have cribbed from below. Our trip to the waterpolo this week afforded us the opportunity to venture a bit further into the park and to enjoy these sweeping borders, all carefully planned to reach their peak during the Games. 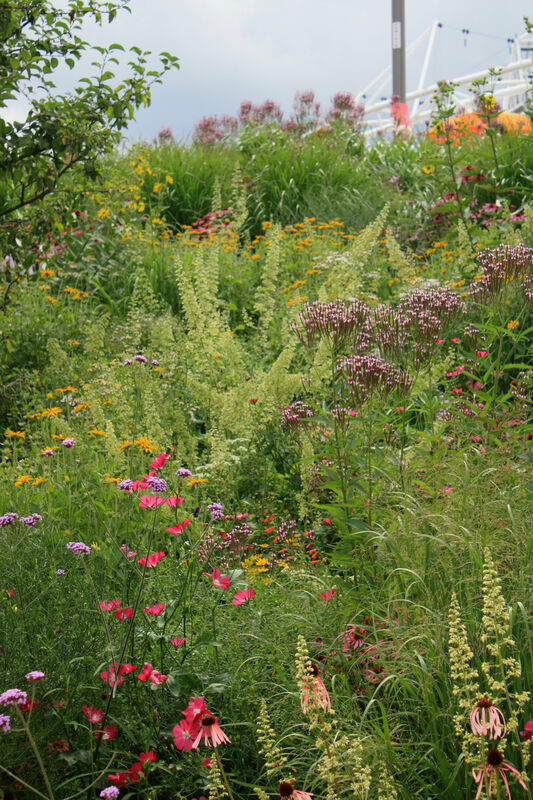 The planting style is informal and loosely structured, which particularly suits the prairie-style North American gardens. European plant collecting from North America was at its height in the 1800s. The plants collected then remain a key source for summer colour in British gardens today. In the above two pictures, to name but a few plants, are several Echinacea: pallida, paradoxa and purpurea “Art’s pride”, “Kim’s knee-high” and “Rubinstern”. These mingle with yellow Silphium laciniatum (the compass plant, so named because the plants tend to align their foliage North – South), orange Asclepias tuberosa (butterfly milkweed) and magenta Callirhoe bushii (bush’s poppy mallow). 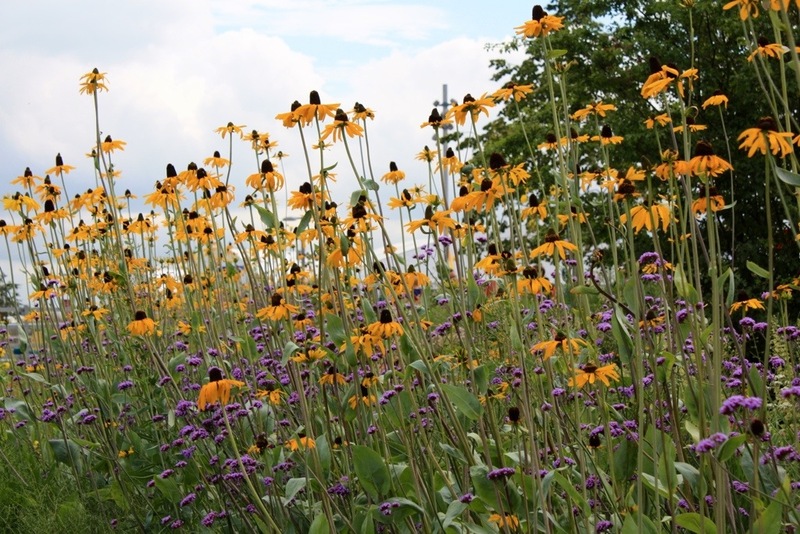 Below Rudbeckia maxima, the great coneflower, reaches heady heights alongside purple Verbena bonariensis. 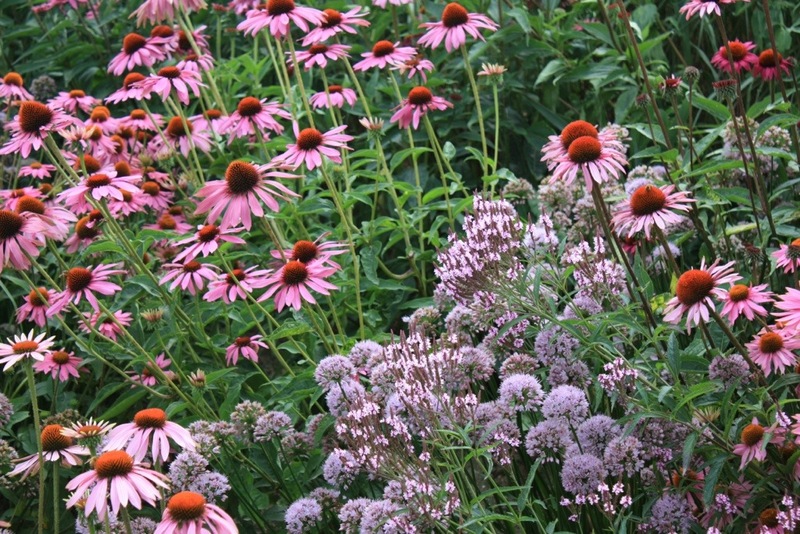 Below Echinacea “Rubinstern” and Allium “Summer Beauty” put on a good show for visitors. This would make a lovely planting combination in any garden. 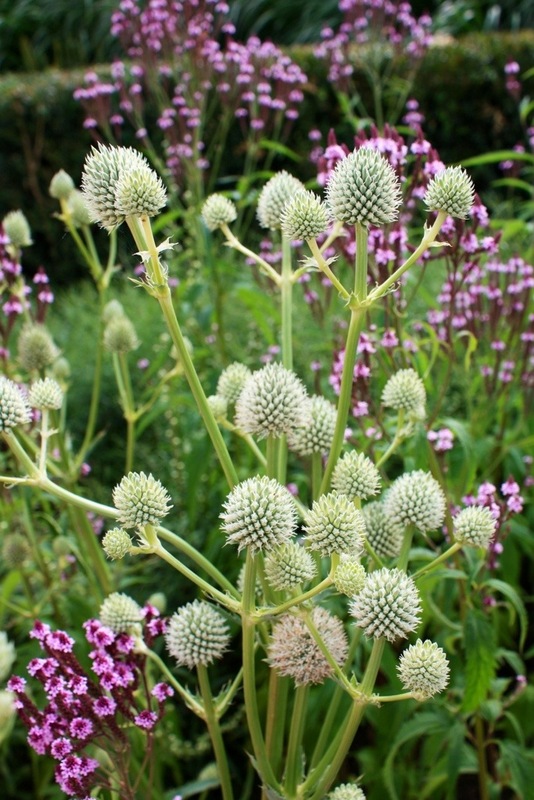 Displaying hundreds of teasle-like flower heads, Eryngium yuccifolium (commonly known as rattlesnake master) is a common herbaceous perennial native to the tallgrass prairies of central and eastern North America. It gets its name because some Native Americans used its root as an antidote for rattlesnake venom. Not much call for that on the Olympic Park, but best to be prepared! The scientific name was given because its leaves resemble those of yuccas, although they have spiney margins. In the foreground and background is pretty Verbena hastata rosea (pink vervain), providing a nice contrast. Not so apparent from my photographs are the numerous grasses which will combine with the spent flower spikes and seedheads of their herbaceous friends to maintain a good display into the autumn and winter. Altogether a very successful piece of planting. If only I had the space to try this out at home. Enjoy the last 2 days of the Olympics, it’s 4 years until the next one!